Are you hitting fairways at a pretty good distance off the tee with regularity? Wonderful. Would you like to try a tiny swing change that will give you a few extra yards? Please say No. Touring pros tinker because they look for every edge they can get. At their level, taking even one stroke off their score makes a big difference in their chances to win. When you as a recreational golfer search for something just a little better, without professional guidance, it could lead to something a lot worse. Getting back to where you were before might take a long time. Believe me, I know. If you’ve been playing golf for a while, the way you swing is pretty much set. Identify the movements that make your swing work well and learn to repeat those movements. Avoid taking your natural swing in a different direction because of the latest thing you read about or saw on TV. this is truly a case of, If it ain’t broke, don’t fix it. The fade is one of the most useful shots in golf. It starts out slightly to the left of the target and curves gently back to the right, sitting down nicely where it lands. If you are able to hit the ball straight with reasonable frequency, a fade is an easy shot to acquire. Whenever we hit different shot than normal, it is best to do it with minimal adjustments to what we normally do. In this case, we’ll hit the fade using our regular swing and our regular grip. All we are going to do is change some of the angles in our setup. That, and a little change in our mental focus, will give us the shot we’re looking for. 1. Align your stance to the left of the target. If the pin were in the center of the green, you would want to start off the ball toward the left edge. Set up as if you were actually going to hit the ball to the left edge of the green. 2. Spin the club clockwise in your hands so the clubface now points between your aim point and where you want the ball to land. In our example, the clubface would be spun so it faced the pin. Be sure to spin the club. Merely turning your hands clockwise won’t do. The adjustment required is slight–only a few degrees is enough. All you need do now is swing the club, using your normal swing, toward where your body is aimed, the left side of the green, and the slight misalignment between the clubface and the club’s path will take care of everything else. Well, almost everything. To prevent this from happening, you must truly believe you are trying to hit the ball onto the left side of the green — that that spot is your actual target. Just setting up for a fade can be done correctly the first time, but learning how to switch your mind from your target to your aim point, which are now different, might take a bit of getting used to. This shot works best with your 7-iron and longer clubs. Short irons put so much backspin on the ball that the sidespin is overwhelmed and the ball doesn’t curve much at all. A fade is handy shot to have in your skill set if you have to hit the ball around an obstacle with room on the left for starting the ball off. You can also use it to get to a pin that is tucked on the right side of the green. Once you get the hang of it, though, you might find you want to make a fade be your everyday, bread-and-butter shot because of the control and consistency it offers. What Do You Want Out of Golf? As you go through your golfing career, it’s a good idea to ask yourself this question every so often: “Why am I doing this? What am I getting out of this?” You should be able to come up with a satisfying answer. But if you can’t, it’s time to reconsider not only what you’re doing, but how you’re doing it. Hopefully, we started playing golf because it was fun to do. We had fun with friends, we enjoyed being on those special place called golf courses, we got thrilled when we hit a good shot or sank a putt we didn’t expect to. It was fun to be in the special club that calls themselves golfers. Somewhere along the line, that changes for many of us. Golf becomes a vehicle for another activity. Or we get caught up in getting good and forget about the fun. Or we forget that golf is a difficult game which returns to us only what we put into it, and get frustrated by the state of our skills instead of enjoying them. Now I can put the two questions above to you, but only you can answer them. I can’t even suggest that your answer should be something like this: “[Insert wise words here].” It’s all up to you. It’s your answer and it’s one that must speak honestly. It takes courage to ask these questions and give yourself honest answers. Because the answers might be, “I don’t know,” and “Nothing.” If that’s the case, then go find something else that fulfills you. Don’t waste your time on a pursuit that doesn’t reward you. But if your examination reveals that the reason you thought you were playing golf isn’t, and what you thought you were getting out is golf isn’t, it might be that you’ve drifted away from the original reasons that golf attracted you and made you want it to be a part of your life. In that case, start over. Find a way to be pleased about something after every round no matter what your score was, and go from there. That’s how you’ll find the rewards, that’s how to ensure golf is a source of joy and happiness. Good putting is all about speed. True, you need to have the right line, but after a certain distance away from the hole, getting the line close enough is all you need to do. Getting the speed right is what makes the difference between two putts and three. Many people think that speed is a matter of feel alone. You can see the line. The contours, or lack of them, are right there in front of you, but you have to feel speed. Not true. Speed is right in front of you, too, if you know how to look. In addition to the length of the putt, there’s the height of the grass, the direction of the grain, the firmness of the green, the amount of moisture in the grass, and slope of the ground, that all affect how hard you will hit the putt. All these can be noticed and taken into account. Your putter is a variable, too, There’s one place on the putterface to hit the putt, called the sweet spot, that allows your stroke to give you a predictable distance response. Many of the times that you left a putt short was not because you didn’t hit it hard enough. You had the right stroke but missed the sweet spot. That said, there is a feel element to finding the right speed. You have to, through practice, know how hard to hit a putt that in general goes 20 feet, or 40 feet, or ten feet. These three basic strokes can then be modified when the length of the putt is different and other variables factor in. But all this comes down to feeling what the right speed to hit this putt is. It doesn’t end with the calculation based on the physical variables. That calculation has to be translated into a feel that your body can use to hit the putt with the right force. How is this done? It’s a mystery, really. Practice will help you get better at it, but feel is elusive on the course because it is affected by the condition of your mind. On some days you can be standing over a 35-footer and just know how hard to hit it. You’ve had days like that haven’t you? But on other days the feeling doesn’t come and it’s just a guess. You’ve had days like that, too. Understand that you do have a feel for distance every day you play. On some days you just have to work harder to get it out. When you can’t feel how hard to hit that 35-foot putt, move in closer to the hole until you find a range from which you do feel the speed. Maybe it’s half that distance. Let that feeling come through your mind into your body, and latch onto the confidence it creates. Then go back to your ball and look at the putt you face, with that feeling of confidence still in mind. The right force to put on the ball will come to you right away. Finding the right speed begins with technical factors that are easily learned. What counts is the control you exercise over your mind to turn those factors into the correct physical movement. Once you know how to do this, every day on the green can be a good day. Do You Learn From Your Golfing Mistakes? Golf is a complicated game. Almost every shot is different from any other you have hit before. At best, you take your knowledge and experience and bring them all together as they bear on the shot you are about to hit. Or do you? Earlier this summer, I hit a drive, just a beautiful one, split the fairway at the greatest distance I can expect to get out of a driver. 110 yards to the pin. Pitching wedge. Except after I had taken my practice swing and stood up to the ball, I noticed for the first time that the lie was slightly sidehill, with the ball below my feet. Not to worry. But I should have. I had to take an easier swing at the ball in order not to lose my balance. Easier swing, less distance, and the ball fell into a bunker in front of the green. I know that when on a sidehill lie you have to take more club because you will be swinging more easily, but I didn’t do it. Mistake. A great drive ruined. And the shot with the pitching wedge was a great one, too. Just that it should have been hit with a 9-iron rather than the PW. So yesterday I drove through the fairway on a sharp dogleg and was hitting uphill into the green from atop a mound, with the ball below my feet. Uphill, plus one club. Ball below my feet, plus one club. From about 130 yards I had my 150-yard iron in my hands. The ball ended up ten feet short of the hole and I canned the putt. Lesson learned. There are lessons to be learned within the same round, too. Did you play for a particular amount of break on the first hole and were wildly off? Adjust your read on the next few greens at least because the greens are behaving differently than they look. Adjust the next time you putt — don’t believe your lying eyes. Or maybe you didn’t hit the first two irons the same distance that you usually do. Adjust. Take one more club until it starts hurting you (odds are it won’t). Remembering is a big part of learning from your mistakes. Hypothetical. You hit your ball to a spot about 20 yards from the green where three weeks ago you tried to hit on with a sand wedge and the ball didn’t release when it hit the green. You might try bumping the ball on with an 8-iron, if you remembered that earlier shot. Do you remember these things? I’m a big believer that every recreational golfer could lower his or her score by 5 percent if they would only (1) think, and (2) remember and learn from the past. This post has been a word to the wise about the second one. I played from the red tees today. Not the Ladies’s Tees, the red tees. Yes, it is primarily women who play from the red tees, but also seniors and people like me who want to try something new. So let’s just call them the red tees. But why would I want to play from there? It’s really too easy, isn’t it? Not really that fair. Kind of like the varsity football team playing the junior high 7th-graders? You see, you get a shorter course from the red tees, but it’s a different course. You have to hit your tee shot to different places. You have to hit different shots into the green. You’re hitting shots you don’t usually hit from places you don’t usually play from. That makes it a different game, and not necessarily an easier one. And you still have to putt. It took me about six holes to adjust my thinking to a new shorter course. What club to use off the tee to set up the club I wanted to use into the green. The red tees were placed in some pretty nasty spots — there wasn’t always a clear look at the fairway, or hazards got brought into play that kept the driver in the bag. In short, the way I played every hole had to be thought through fresh. Shorter doesn’t mean easier. You can still hit your drive into the weeds. You can still clank an iron into a water hazard. You can still three-putt. You can get caught up between both getting to greedy and being too conservative, and get bitten each way. You still have to hit good shots to score, and you will still pay for the bad ones. Playing a shorter course doesn’t mean that you’ll hit very shot pure. 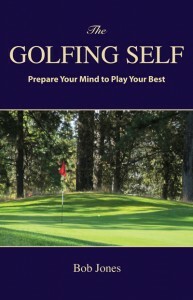 It means you have to manage your mistakes in a different way, and find out how to think your way around an unfamiliar golf course. 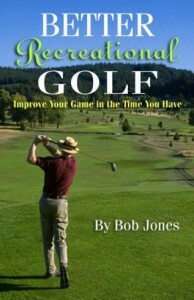 In short, it will open your eyes about how you make your way around a golf course, and expose deficiencies in your game you didn’t realize were there. I predicted I’d shoot a 78, shot a 79. It was great fun the whole day. I recommend you try it. These five tips are little differences that will make a big difference literally overnight in the way you swing a golf club. One hour of practice is all you need to install them in your swing. They will give you a feeling of confidence, control, and ease, three characteristics of good golf. There is a natural balance point for every club. This is where you hold the club and it feels light, and as if it were an extension of your hands and arms. For most clubs this will be felt when you grip down about 1″-1½” from the end of the grip. When you hold the club at this point, you will feel relaxed and at ease. Swing the club the way this feeling suggests. Take your stance slightly open to the intended line of flight. Just a little bit. No more than 5 degrees. Being slightly open will let you get your left hip cleared better, and allow you to come into the ball with the right side a little more “underneath” the ball. The first gets the club down the target line more easily, and the second gets the ball in the air more easily. Swing the club easily. There is no need to rush going back, and certainly no rush going down. If anything, swing more slowly than you think you need to. Make it almost like an easy practice swing. The speed that such a swing will build up is greater than you feel. Combined with the design of the club, you will hit the ball a long way. If your ball-striking gets off during a round, check the speed of your swing first. Odds are that you are swinging too fast, especially at the start of the downswing. You might have heard the phrase, “finish your backswing.” What does that mean? For every club you swing, from driver to wedge, and even when pitching, it means to finish turning your body before you start your downswing. Get the left shoulder as close to your chin as you can, and your right shoulder turned away as far as you can, without straining. It is not necessary that your arms go to a particular place, but that your turn be full. When our mind begins to wander on the course, this turns gets shorter, and our ball-striking worsens. One difference between the professional swing and the amateur swing is that professionals do not allow the clubhead to pass their hands until after the ball has been struck. That means when the clubhead is impacting the ball, the shaft is tilted toward the target, not vertical, or worse, tilting away from the target. You ensure this happens by maintaining the wrist set you have at the top of the backswing until your hands get back down to hip height. At that point, the momentum of your swing will release the set, but continue swinging and let the hands win the race with the clubhead to get to and past the ball. Lots of players like to keep track of their game as they play. They write down fairways hit, greens hit in regulation, up and downs, number of putts, and so on. Those statistics don’t really tell you what you need to do to improve, because they are effects, not causes. Instead, keep track of which shots come off like you had intended, and the reasons why something else happened. Only then will you get the information you need to know about what is working and what is not. I would suggest that after you get home you answer these two questions for every shot you hit. Be honest. Notice that most reasons you miss shots are mental mistakes. Sure, better technique cannot be denied. But it’s the mind that lets the skills you have come to the fore, no matter how good you are. A few weeks ago, I teed off on a rather difficult par 4 hole. Goes uphill a bit, angles to the right. The green is guarded by two well placed bunkers on the left and there’s bad ground on the right. My drive splits the fairway, and my approach from ~170 starts off to the right and curls to the left, toward the flag tucked behind the bunkers. When I get to the green, I see the flag is all the way back left in a little corner that has to be nearly impossible to get to, but there’s my ball only twelve feet away. Wow. Getting a birdie with the pin here would be the accomplishment of the year. I get the putt lined up, put a good stroke on it, the ball is rolling dead toward the hole, and it stops a foot short. Par. You know why it stopped short? The putt was slightly downhill and I didn’t want to blow it by and have a four-footer coming back and turn a possible birdie into a bogey. Maddening. And you know what? I found out this morning I’m not alone. A study by Devin Pope and Maurice Schweitz of the Wharton School, titled Is Tiger Woods Risk Averse? Persistent Bias on the Face of Competition, and High Stakes , shows that PGA pros do the same thing. They will make identical putts 3.3% less often if it is a birdie putt than a par putt. Why? Because they are risk averse, just like you and me. They consider the risk of getting a bogey and dropping a shot to be greater than the reward of gaining one by sinking the birdie putt. I’ll bet this applies to you, too, though maybe on a different level. I would bet you make more eight-foot putts for bogey than you do for par. You’re used to getting bogeys, but those doubles just cannot happen. So you bear down more to get that par putt in the hole. It would be nice if a putt is just a putt. Whatever score it is for, we would treat them all the same. But maybe a bit of reverse psychology would be in order. The next time you have a birdie putt, pretend it is for par. That might help you give the ball the extra oomph it needs to go in. Sometime I go to the range and hit golf balls just great. I come home and think I have finally found it. Then the next time I go out I can’t repeat my success because I forgot what I did. Raise your hand if that’s you, too. I finally figure out what’s wrong. Those swings have been too complicated. Too many moving parts. Too many positions to hit, too many movements to make. It’s a wonder I can do it once. The solution, and your entrée to a good golf swing, is to simplify it. Just take the club back, and swing it through. You have a basic swing; you know how to hit the ball. What I’m saying is start throwing out the complicated stuff, all those little things you try to keep track of. See how much you can simplify your swing. See how easy you can make it. Strip away all the non-essentials and just swing back and through. Sure, there will still be a lot of stuff going on. Even a”simple” swing isn’t simple. But here’s what you will find out. When your swing has been simplified, the thought that will be in your head when you’re standing over the ball is one of performing with confidence. You will know, trust completely, that if you swing this way the ball will go straight and far. That it just has to. I would bet that if you asked a number of golfers how confident they feel over the ball, they would say, “Not that much all the time.” It’s that confidence that leads to a good shot, and you only have confidence if you know what you’re doing. Really know what you’re doing. 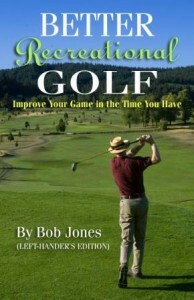 And how much easier is to really know what you’re doing if your swing is so simple that you could do it in your sleep? That’s the key here. It’s getting a swing that is so easy for you to remember that you can do it time after time, day after day, month after month. That swing is a simple swing. So go to the range, or better, take some plastic golf balls to your back yard, and start getting rid of the baggage. Go for a simple, relaxed, rhythmic swing. It’s all you need to play well.